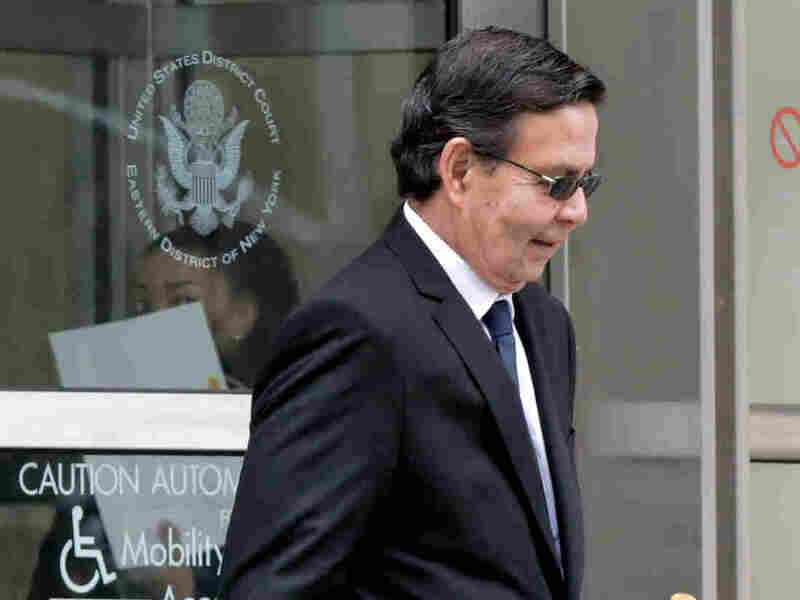 In Vast FIFA Scandal, Ex-President Of Honduras Pleads Guilty To Taking Bribes : The Two-Way In federal court in New York City, Rafael Callejas admitted to taking bribes over lucrative broadcast rights. He was head of the Honduran soccer federation from 2002 to 2015. Former Honduran President Rafael Callejas leaves federal court in New York City on Monday after pleading guilty to conspiracy charges in a wide-ranging FIFA soccer scandal. In the latest development in the FIFA soccer scandal, Rafael Callejas, a former president of Honduras and the head of the country's soccer federation from 2002 to 2015, pleaded guilty to corruption charges. He had been accused of taking bribes in steering lucrative broadcast rights. According to the Department of Justice, Callejas "negotiated and accepted bribes totaling hundreds of thousands of dollars in exchange for his agreement to exercise his influence as the president of [the Honduran soccer federation] to award contracts to Media World, a Florida sports marketing company." The contracts covered the "media and marketing rights to the Honduran national soccer team's home World Cup qualifier matches for the 2014, 2018, and 2022 editions of the World Cup," the DOJ said in a statement. In federal court in Brooklyn, N.Y., on Monday, Callejas pleaded guilty to charges of racketeering conspiracy and wire fraud conspiracy. NPR's Hansi Lo Wang reports that Callejas faces up to four decades in prison and has agreed to forfeit $650,000. Callejas is set to be sentenced in August. According to The Associated Press, Callejas "told the judge that he had accepted bribes and distributed some of the money to others. He said he knew it was wrong." The disgraced leader, who was president of Honduras from 1990 to 1994, also agreed to forfeit $650,000. "Seven officials named in [the] announcement are from North America's soccer federation, CONCACAF, and nine are from South America's federation, CONMEBOL. Of the 16 new defendants, all of whom are facing charges including racketeering, five are current or former members of the FIFA executive committee." In the December crackdown, the AP notes, those five current and former members of the executive committee were arrested at the same Zurich hotel where the arrest of the seven FIFA officials occurred six months earlier. The news service adds that "the Justice Department has said that numerous guilty pleas in the case have resulted in agreements to forfeit over $190 million, and another $100 million has been restrained in the U.S. and abroad."